A lot of social media advice sounds something like this: start using social media, schedule your social posts ahead of time, have a consistent presence, and then you’ll find new customers! If you’ve given this technique a try, you might have realized it’s not always quite that easy. And as a small business owner, you have plenty of other projects vying for your attention. The best way to build an active and engaged audience on social media is to focus on the people who already know you best. By sharing content that’s relevant to them, and taking the time to interact and respond to any feedback you receive, you’ll be able to grow the size of your audience and build stronger relationships in the process. But when it comes to seeking out new customers on social media, there are also a few simple steps you can take to help you reach the right audience for your business. Knowing your ideal customer persona is half the battle. You also need to think about the problem(s) your product or service solves. What language would a customer use to identify the problem? What is the best way to engage with this customer? At MarketMeSuite, we help small businesses succeed on social media, so I use MarketMeSuite’s Real-time Search to find conversations on social media that include keywords like social media help, small business help, and SMB tips. When I find people using these keywords, I can easily learn which social networks my customers are using. I can also determine the type of content they want and the best time and frequency to post. This makes me much more effective at reaching my audience on social media. The next step is to find and track conversations. Hashtags do some of the work for you by helping you find a number of people talking about the same topic. Once you’ve determined your relevant hashtags, monitor them to find the conversations you should be a part of. The hashtags I follow include #smallbusiness (my target audience), #MarketMeSuite (our company name for monitoring), and #socialmediahelp (conversations where I can add my expertise). Here’s an extra tip: You can also find the influencers you should be liking and following using hashtags. Influencers are experts in topics related to your business and often have a large following. Engaging with them can help you gain exposure to a bigger, equally targeted audience. Once you’ve found social conversations that are relevant to your business, you can start to engage potential customers and share your expertise. Make sure to add to the conversation without disrupting it. If people are sharing and commenting on articles related to your business, look for opportunities to share your perspective. If people ask questions you can answer, offer your help. Here’s an extra tip: If you already partner with other businesses, you can look for opportunities to engage with your shared audiences on social media. For example, one of the most complementary tools to MarketMeSuite is Constant Contact. Our companies share the same goal of helping small businesses succeed. We often share each other’s content, and when the topic of social comes up, I look for opportunities to share my expertise and let them know how MarketMeSuite and Constant Contact work together to supercharge social media. Hopefully, all your hard work of finding and connecting with potential customers on social media will pay off in the forms of new fans and followers. As you start engaging with your new audience, it’s important to provide a strong call to action to help move interactions beyond social media. 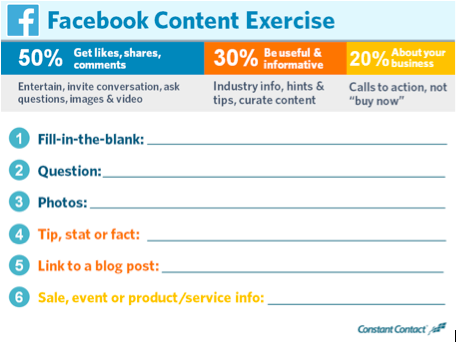 Posts that provide a call to action are more likely to get engagement (i.e. likes, follows, shares, retweets, favorites) from your audience. Make sure your call to action isn’t always directly related to your product or service. People often use social media to be entertained, to find valuable information, and to interact with friends and businesses. You can make your content engaging by asking your audience a fill-in-the-blank or true or false question. As a rule, about half your content should be solely focused on engagement, with only about 20% of your content focused on the promotion of your business. You can use this chart as a reference. Have you been successful finding new customers on social media? How did you do it? Let’s chat! Just respond below. About the author: Allison Davis is Community Manager at MarketMeSuite, a social media marketing and engagement platform for small businesses. She’s an expert in social media engagement and is the face behind MarketMeSuite’s social channels. 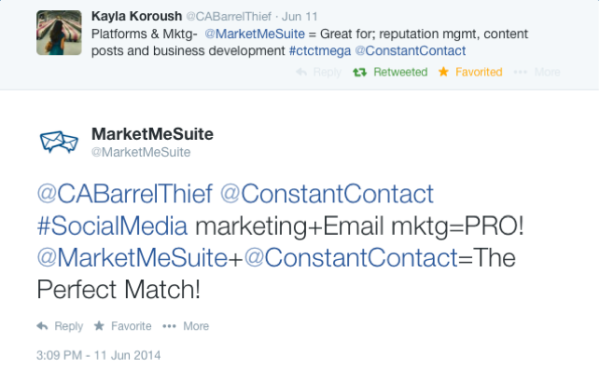 MarketMeSuite was the first company to pilot Constant Contact’s Small Business Innovation Program.